Thank you! That is the best response I've read to all this duck nonsense. Isn't there something in the Bible like "Go ye out and make a duck?" Or was that an ark? Whatever. I like your duck. 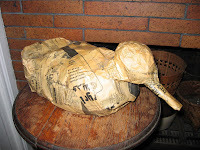 That is an alarmingly well-made duck considering there was Springsteen and vodka involved. I'm impressed! That title just cracked me up. Sounds like a great name for a rock band. I'm sure the duck will take good care of things while you're gone. Have a good trip!